This presentation addresses the ways nineteenth-century women sought to remember those who proceeded them, focusing on the work of the Daughters of the American Revolution (DAR) to create and sustain an organization dedicated to remembrance. 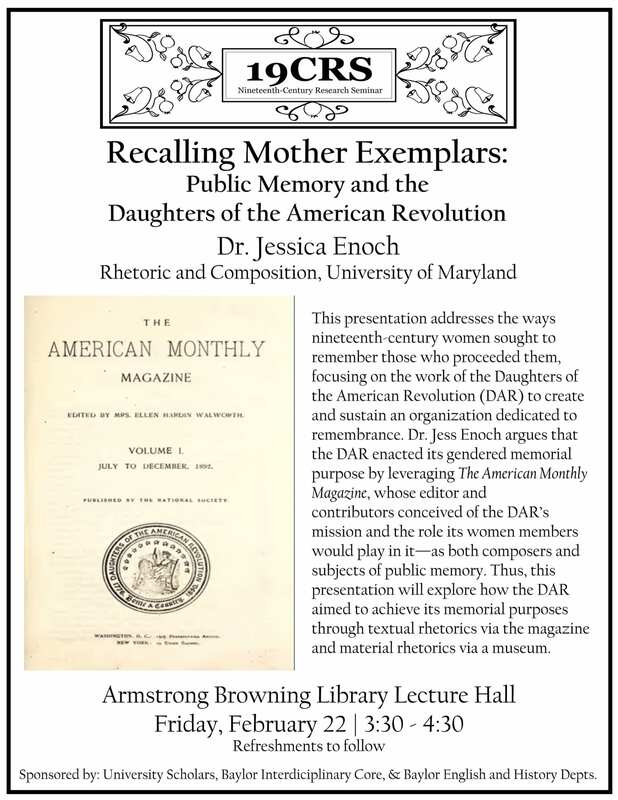 Dr. Jess Enoch argues that the DAR enacted its gendered memorial purpose by leveraging The American Monthly Magazine, whose editor and contributors conceived of the DAR’s mission and the role its women members would play in it—as both composers and subjects of public memory. Thus, this presentation will explore how the DAR aimed to achieve its memorial purposes through textual rhetorics via the magazine and material rhetorics via a museum.